No Indian meal is complete without mithai (sweets) dessert. Luckily for Indians, there are a wide variety of sweets from Bengali Rasamalai, Gujarati Emarti, Punjabi Pinni to South Indian Ladu, Ariselu and more. I always top of my Indian meal with either a Gulab Jamun or Kheer or Kaju Pista roll. 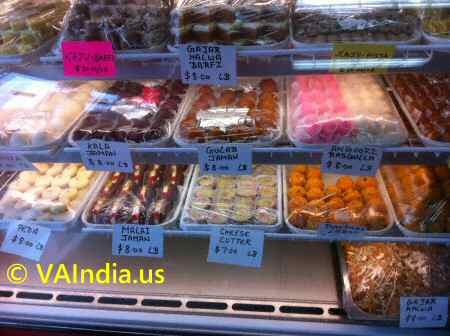 If you have sweet tooth like me, there are a few mithai stores in Virginia where you can satisfy your sweet cravings. Whether it is Kaju Barfi, Sandesh, Mohan Thal, Gajar Halwa, Kala Jamun, Gulab Jamun, Jalebi, Motichor Ladu, Chocolate Barfi, Kaju Katli you get them all and more. In addition to the sweets, Virginia Indian Sweets stores also offer spicy Indian snacks like Kara Boondi, Muruku, Plantain Chips, Mixture etc as well.